International School provides education for international students who may have no knowledge of Dutch at mother tongue level. The main language is English, but students of course also learn Dutch. The programme varies per student but always fits the requirements International Baccalaureate. Leaving us at 18, with an IB Diploma, you can follow whatever education you want, wherever you want. TTO (tweetalig onderwijs) is bilingual education for students who are fluent in Dutch and who want to get some of their education in English. If you go to TTO, you are educated in the Dutch system at HAVO or VWO level. If a student is not fluent in Dutch, the risk of failure is significant. If you would like to go to TTO but are not sure about your level of Dutch, just contact us. Together we will find the school and level of education that suits you best. 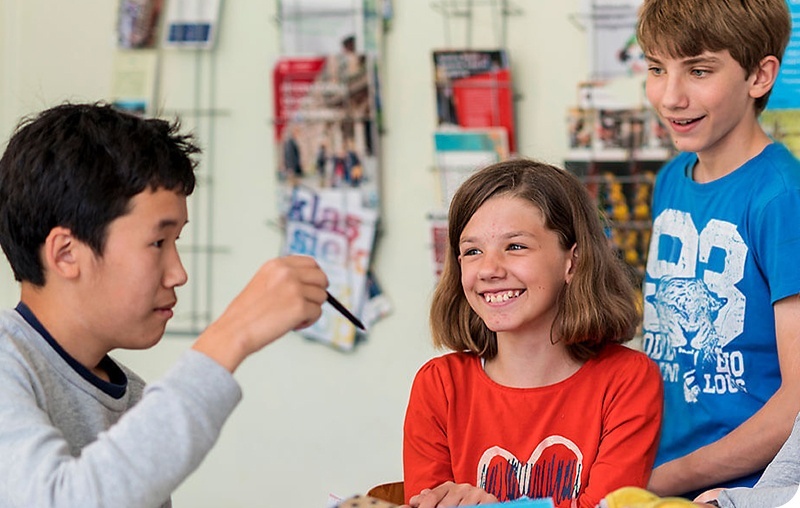 International School Groningen offers two programmes: the Middle Years Programme (MYP) and the Diploma Programme (DP). The MYP prepares students for the DP. The MYP is the International Baccalaureate Middle Years Programme for students aged 11 – 16. It is a challenging framework for the taught curriculum. The MYP prepares students for the DP. MYP reflects real life: students see the links between subjects and the real life issues in their community and beyond. The International Baccalaureate Diploma Programme is a two-year pre-university course, leading up to the IB-diploma, which is the only secondary-school diploma to provide worldwide university admission. The IBDP prepares highly motivated students aged 16 to 19 for further academic studies. The DP course at the International School is supervised by Joke Jansma (Deputy Head - Diploma Programme). Every student earns CAS points for dedicating time to the community and helping others. These points are an integrated part of the MYP and DP programmes. Want to know more about MYP? Download and have a look at our dedicated MYP section. Want to know more about DP? Download and have a look at our dedicated DP section. What do you want to do after you graduate from school? How do you decide which study programme to choose? Is there a programme that prepares you for what you want to do with your life, and how do you know if it is the right one? Our careers counsellor Mr Goodijk is there for all your questions. Orientation. You have no idea at all and expect answers to questions like: What are my interests? What am I good at? Exploration and elimination. Try to find out what interests you most and which courses in your field of interest meet these preferences. Do you meet the entrance requirements? Going into depth. Check if your idea about these courses is realistic and if they will be the right choice for you. Take the final decision. Prepare and send in your application. Do you still have doubts?